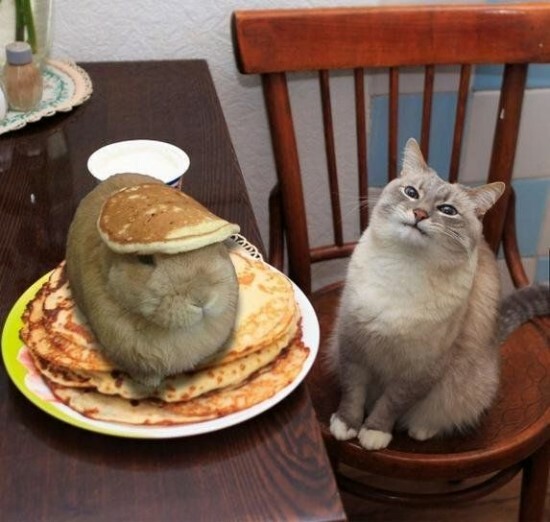 A bunny sitting on a stack of pancakes, with another small pancake on its head. A cat stares at it with a very disturbed expression. Image source. 2. Hallowed Be Thy Name (posted September 27) "These words are actually a petition, a prayer for God to act in hallowing God's own name." 3. 5 Reasons for Writing about Polyamorous Families (posted October 5) "It is a vile and, to me, incomprehensible thing that so many people view the destruction of families as a lesser sin than the living out of fruitful, covenantal love between more than two people." 5. Voices in Your Head: Evangelicals and the Voice of God (posted October 10) [content note: murder of children] "But when I met someone who was hearing voices in her head, as a young evangelical adult, I thought it was normal because that was the template my religion had provided me." Yep, Libby Anne's experiences are pretty much the same as mine.